James is fourth generation member of the DeFuniak Springs community whose deep roots are vested in his philosophy to make his hometown the best place it can be. James is married to his high school sweet heart Marie Watts Hurley where they have three boys, Jack, Max and James Henry. James serves his community not only by his career but also volunteers his time to coach little league baseball to the youth of DeFuniak Springs. James is a member and Deacon of First Baptist Church, and is a member of the praise and worship band. James is a member of the Walton County prevention coalition, whose mission is to reduce substance abuse for youth and families. 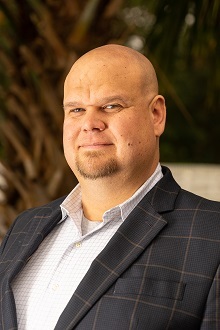 James is currently a Senior Special Agent with the Florida Division of Alcoholic Beverages & Tobacco whose office covers eight counties in the panhandle to include Walton. James is a graduate of Walton Senior High. During his senior year of High School James was a member / officer of the DCT program where he began his employment at the Walton County Sheriff’s Office at the age of 16 years old. Upon Graduating from Walton High James attended OWCC where he received an Associate’s degree in Criminal Justice. James attended the OWCC Law Enforcement Basic recruit class and was sworn in as a Walton County Deputy at the age of 20 years old. While working 40+ hours a week as a deputy James continued his education and graduated from the Florida State University receiving a Bachelor of Science Degree in Criminology. Since being a law enforcement officer James has changed roles and now has become the teacher. James is a Florida certified high liability law enforcement instructor where he teaches and instructs other law enforcement officers throughout the state in various subjects on Law Enforcement. At the age of 20 James was sworn in as a Walton County Deputy where he began his lifelong commitment to serve his community. During his time at the Sheriff’s Office James was tasked with many responsibilities. James was a K-9 officer where he tracked and apprehended suspects and missing children. James developed and implemented a system to track and monitor registered sexual offenders in Walton County. James served as alternate evidence vault custodian where he processed and maintained all evidence for the Sheriffs Office. James was assigned to the Investigations Division where he worked and assisted on cases from thefts to homicides. In December 2005 James accepted a position as a Special Agent for the Florida Division of Alcoholic Beverages and Tobacco. During this time James has investigated hundreds of crimes from narcotics, stolen property, human trafficking, gambling, and combating underage possession of alcohol and tobacco by our youth. James took initiative in Walton County and led the fight on synthetic drugs by seizing several pounds of the illicit narcotics from local retail outlets. During his time with the State James has been nominated as State Law Enforcement Officer of the year, and has received numerous recognitions by Mothers against Drunk Driving, and the United States Attorney’s Office, for the work that he has done. In 2018 James received the life saving award where he was credited in saving a young woman's life after she had been struck by a drunk driver.